Almost another year is about to be behind us. 52 weeks of life, living, working, socialising, creating new memories. 365 days of experiencing the highs and lows of what is thrown our way. I don’t know about you, but I’m really feeling it this year. 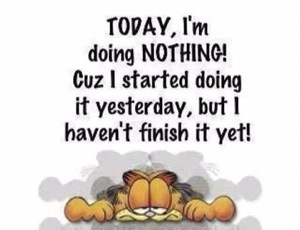 I’m tired, fatigued, drained and so ready for a holiday! One of the highs for me this year has been my running! I’ve set so many goals and achieved most of them, but I’ve come to the realisation, that with all the kilometres my feet have pounded the pavement and with no real break to my routine at all, my body is starting to scream at me to stop! So after I sweat out all the junk that I consume on Christmas Day on Boxing Day lol, I am going to have a weeks break! A week may not sound like much, but I know it will be enough to start fresh again in the new year! I would have 2 weeks off, but we are holidaying at the coast and I love nothing more than running at the beach! I can honestly say I never felt like this a year ago, but upon reflection I realised that twice last year I was sick and sidelined for two weeks at two different times throughout the year. This year I’ve been lucky enough to only battle with a minor virus here and there but nothing extreme to warrant a big break! It’s hard to break a routine that has been going so well for so long, but I believe my decision is a sensible one. I believe that our bodies are precious and should be treated like gold. We are in control of ourselves and we only have one chance at life, so we need to do the best we can…it’s so important to LiSTEN to our bodies!!!! Life has been one crazy ride this year. It’s felt like an uphill battle at times. So many ups and downs, but one common denominator, that I believe has been my therapy, has been my running! Through my running I’ve been able to plan and reflect on things that have been happening. I’ve been able to let my frustrations out without being inappropriate. It’s kept me sane when I’ve felt I was close to insanity lol, but most importantly it’s provided me with my health and fitness! Some of my highlights this year have been; running 10k in 48.52mins, 5k in 23.25mins and running my original running distance of 4k in under 19mins twice!!! Running a PB always leaves you feeling so pumped. In that moment, you are the only one who knows how you are feeling. It leaves you feeling invigorated and on top of the world…I love that feeling, which is why I love running! But as much as I love my running, I know it’s time to stop! My joints are screaming, my legs are hating on me. Once I finish my 10k run this Thursday, that will be the last 10k I run for 2 weeks. During my time off, I will continue to walk each day for half an hour and I will continue my normal balanced eating regime. I will create a new set of goals to work on in the new year, but one thing is for certain, I will not lose sight! 2013 has been a successful running year…I look forward to sharing any of my excitement with my running in 2014!!! 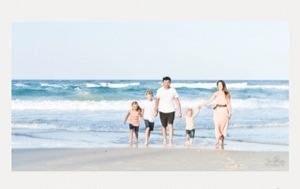 I’m looking forward to a break:)…10 more sleeps and then sun, sand, surf and lots of laughter with my beautiful Party of 5! 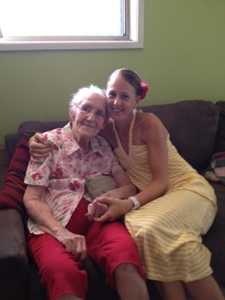 Yesterday we lost a great lady…Gloria Holpen – my darling nana! She was a loving wife to my grandad, mother to my mother and uncles and was ‘nana’ to 10 grandchildren and 12 great-grandchildren. She was a mother in law, a sister, an aunty and a true friend to anyone she met. She was loving, she was loyal…one of the greatest women I’ve been privileged to have in my life! 5 weeks ago nana was rushed to hospital when she fell ill with a stomach obstruction. 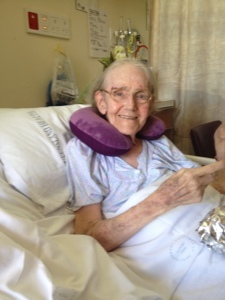 We were told to prepare for the worst then, but through her pure strength and determination, nana recovered and was ready to be discharged when a spot became available in a nursing home. Then last thursday unexpectedly, nana took a turn for the worst and started vomitting…another stomach obstruction, this time worse, this time there was nothing the medical professionals could do. Sadly nana was diagnosed with Parkinson’s Disease 5 years ago and now that she was in the late stages of this horrible debilitating disease, her bowel and gut system was paralysing and she was unable to eat or drink. We were told last weekend that nana only had a couple of days to live. She lasted 8 days. 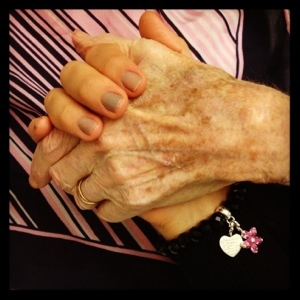 In her final days, most of the family were able to spend time with nana, comforting her when she was in pain, holding her hand when she seemed scared and whispering in her ear how much we loved her and that she needed to be brave. This past week has been gut wrenching. 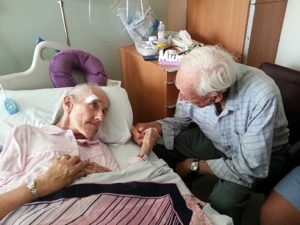 Watching my grandad in his final days with his wife of over 60 years was nothing short of torture! Seeing how distraught my mum was at the thought of never seeing her mother again. We’ve cried an ocean of tears, but the most uplifting part of this week has been the realisation of how powerful family love can be. The hospital staff were amazed at how long nana held on for. For an 80-year-old women to last 8 days without food or water showed how strong and courageous nana really was. And although nana had many loved ones waiting for her on the other side, she knew she was leaving so much behind! The closeness and love our family shares started way back when nana and grandad started their own family…nana has left this legacy behind and as a family we will keep this going. How do you say goodbye to someone who has been there for every stage of your life? As I close my eyes I remember so many precious moments with nana. Her gorgeous smile, her laugh, her beautiful blue eyes and how she always had the ability to put a smile on my face. I’ll treasure the safe and secure feeling I always had when in my nana’s presence and to say I won’t have that again is something I’m trying to come to terms with. This week will be tough for everyone. Even though many tears are still to be shed, we are determined to make sure nana’s funeral is a celebration of her life and the amazing lady she was. When nana’s time on earth came to end on June 1st at 11.15am, heaven gained a special angel who will be there to watch over us every step of our ways. 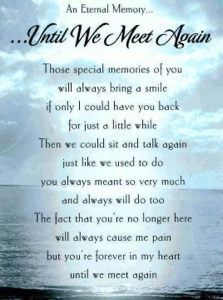 So for now nana it isn’t goodbye, rather until we meet again….. 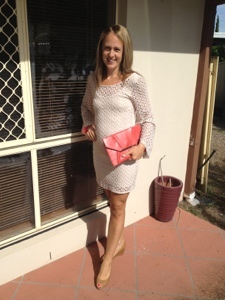 This time last year I had very little winter clothes coming into the cooler months! I had just reached my goal weight after losing around 13kgs in 6 months through eating healthy (basically cutting out the crap) and exercising (mainly running)! I’m happy to say that a year later I have plenty of winter clothes to choose from and they all still fit as I’ve maintained my goal weight! Like anything losing it really is the easy part, it’s the maintenance part that can be challenging. It’s funny how the power of our mind is the key to all of this. When losing weight your mindset is quite different to when you are maintaining. You go from being very strict with yourself to relaxing a little and treating yourself a bit here and a bit there, but if not managed well, this can be the start of where weight creeps back on! Then you can go the other extreme and become obsessed to the point where you lose too much weight and start to look too thin – not healthy ….trust me I know I’ve been there and it’s not nice! Last year after getting to my goal weight I lost a bit more and a bit more and then before I knew I was struck down with a terrible gastro bug for days which left me looking very unhealthy and very sick looking! I learnt a lot from all of that! It taught me to get myself at a weight where I have some reserves. Getting down to a weight that is too thin for your height is like living on the edge. You may look healthy and trim but what reserves do you have if you get sick?? It took me months to build my body fat and muscle back to where it was. But I did and a year later I feel fitter, stronger and healthier than I’ve ever been! Anyone can lose weight and become fit. But the way we do it is completely individualised. We are who we are and we are all individuals breathing the same oxygen, but no one can force you to do something that you don’t want to do…only YOU can be the one to make the decision:) I believe before training your eating habits and body, you have to train your mind, because if your mind isn’t at it’s best nothing else will be!